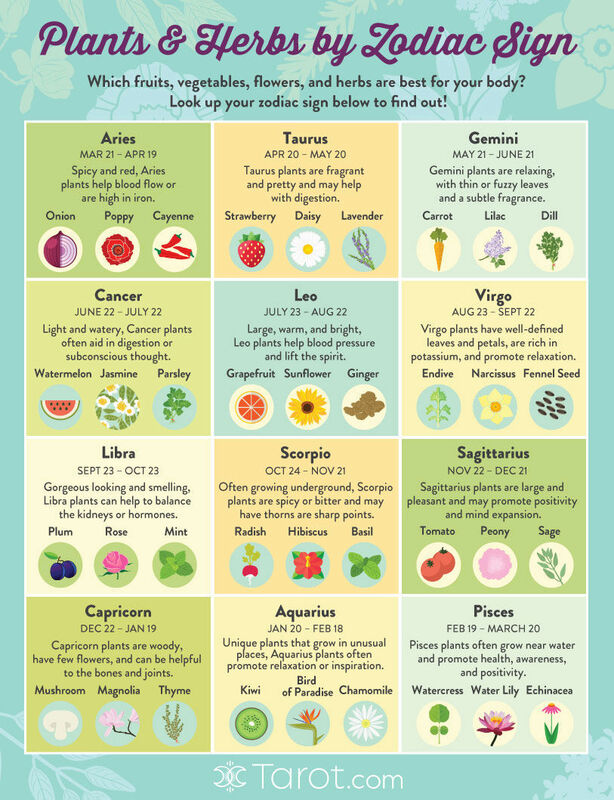 Which plants, herbs, fruits and vegetables are most helpful to YOUR zodiac sign? Each of the 12 signs can benefit from the properties of certain plants, which help to heal, grow, balance, and inspire. Look up your sign below and thrive by filling your garden, refrigerator, and home with these brilliant gifts from Mother Nature! 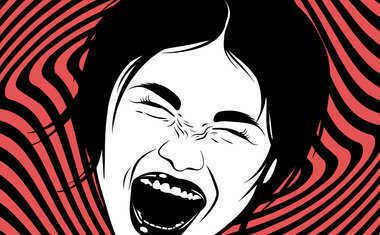 Aries is a Fire sign ruled by the planet Mars. Plants associated with this element and planet usually have thorns or prickles. They are also spicy or bitter in flavor or are red in color. Because Aries rules the head, eyes and face, the best plants for Aries are those that purify the blood, stimulate the adrenal glands, or are high in iron (Mars rules the mineral iron). Taurus is an Earth sign ruled by the planet Venus. Venus is the planet that represents desire and beauty, so Taurus plants often have gorgeous flowers and enticing fragrances. Because Taurus rules the throat and ears, the best plants for the Bull are often soothing to the throat, or may calm the digestive system after overindulging in the finest foods. Ruled by the planet Mercury, Gemini is an Air sign that rules the lungs, shoulders, arms, and hands. Gemini's plants usually feature finely divided leaves or stems (like the bronchi of lungs), hairy or fuzzy leaves (related to the cilia in the lungs), or subtle odors. Plants associated with Gemini help to strengthen the lungs and respiratory system, or relax the nervous system. Because Cancer is a Water sign and is ruled by the Moon, Cancer's plants generally have soft or Moon-shaped leaves, contain a lot of moisture, or are found near water. Oftentimes they are white in color, or have white or pale yellow flowers. Cancer rules the stomach, breasts, diaphragm, and liver, so plants that aid digestion or affect the subconscious are associated with the sign of the Crab. Naturally, Leo is a Fire sign ruled by the brilliant Sun. The part of the body ruled by Leo the Lion is the heart. Leo's plants are usually large and gold or orange in color, or have heart-shaped leaves or a radiating shape. Plants that regulate blood pressure and have an uplifting effect on the spirit are most beneficial to Leo. Virgo is an Earth sign ruled by the planet Mercury. Virgo is traditionally the Goddess of the Grain, and is associated with autumn. Her plants often have finely divided leaves or stems, subtle odors, or small, brightly-colored flowers. The most beneficial plants for Virgo are high in potassium and help to calm the nerves. Libra is an Air sign, and is ruled by the planet Venus. Because Venus is the planet of beauty and love, Libra's plants often have light, lovely flowers and gorgeous scents. Libra rules the kidneys and the adrenals, so her plants help to bring balance to these areas of the body. A Water sign ruled by both Mars and Pluto, Scorpio's plants are often found in remote places or underground. They will likely have thorns, be red in color, and grow under adversity. The reproductive organs are ruled by Scorpio, so plants that balance the hormones, regulate the menstrual cycle, or help with childbirth and pregnancy are very beneficial to Scorpio. Sagittarius is a Fire sign that is ruled by the planet large and optimistic planet Jupiter. So the Archer's plants tend to be large in size and fairly conspicuous, with a pleasant odor. The best plants for Sagittarius will support the liver, are high in the mineral silica, and promote a positive frame of mind. As an Earth sign ruled by the planet Saturn, Capricorn's plants usually have few flowers, are knobby or woody, and may have an unpleasant smell or taste. Saturn rules plants with long lives and slow growth, so plants with annual rings are also associated with the Goat. And because Capricorn rules the knees, joints, bones, and teeth, plants that are high in calcium can be very beneficial. Aquarius is an Air sign ruled by odd-ball Uranus, so the Water-bearer's plants will often grow in unusual places and may vary in appearance. The most healing and beneficial plants for Aquarius are ones that help circulation, relax the nervous system, or promote inspiration. As a Water sign ruled by both Jupiter and Neptune, Pisces plants are often large but hard to find, and may grow near the ocean. The most healing plants for Pisces are those that strengthen the immune system or have an antibacterial effect. Pisces plants may also catalyze expanded states of awareness and be helpful in dream work.